When Do Limelight Hydrangeas Bloom? Do Hydrangeas Die in Cold Weather? What Month Do Hydrangeas Bloom? What Causes Hydrangeas Not to Bloom? When Do You Cut Back Hydrangeas? According to the United States National Arboretum, there are "approximately 23 species of hydrangea; only five are widely cultivated in the U.S.," with the more often chosen being the big-leaf or French hydrangea. With proper care and winterizing, hydrangeas will bloom for many seasons. Water hydrangea bushes after the blooming season. The bush needs 1 inch of water each week. If the bush is wilting in the morning, water thoroughly. Mound pine needle mulch underneath the hydrangea, mounding it up beside the base. If the hydrangea is planted near pine trees, rake the fallen pine needles under the bush. 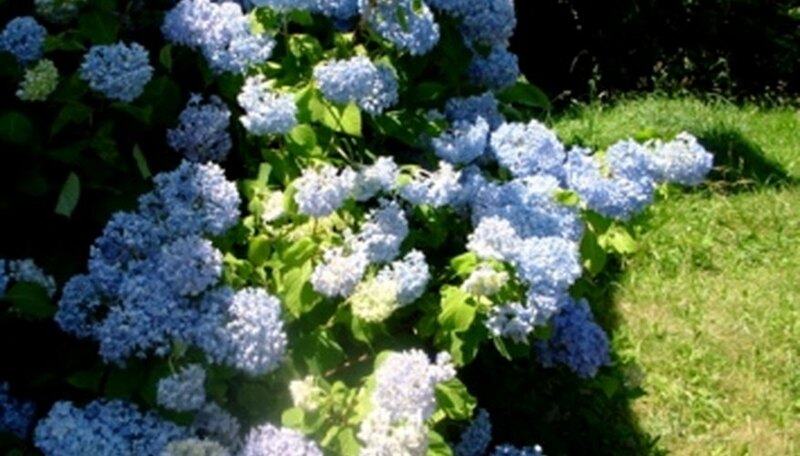 The acidity in the pine needles can change the pH in the soil and, in some cases, will change pink hydrangea blossoms to blue. Spread a layer of mulch or decaying leaves over the pine needles. This not only helps retain soil moisture and heat, it also helps to hold the pine needles in place during rain. Make a cage that fits around the hydrangea. It can be made with chicken wire or cardboard. Leave sufficient room within the cage to cover the entire plant and not damage the branches. Fill the cage with decaying leaves or pine needle mulch. Cover the tips and avoid breaking the branches. Rake extra leaves and place them in bags. Store the bags in a place that does not freeze, like the garage. If the insulating materials settles in the cage, add leaves from the bags. Cut out broken stems anytime during the growing season. Make an angle cut 6 inches away from the break. Prune to shape from late fall to early spring. Annabelle hydrangea blooms on new growth so prune while the shrub is dormant. Prune spent blooms anytime. Make cuts on an angle immediately above a bud or set of leaves. Prune an overgrown Annabelle hydrangea 10 to 12 inches above ground. Cutting any shorter could result in weak stems that might not be able to support blooms. Wait for the first frost for the hydrangea to become dormant and finish dropping leaves. Rake away any old mulch, leaves, twigs or other material from around the base of the plant. Spread a fresh 4-inch layer of mulch around the base of the plant. Space eight garden stakes around the perimeter of the hydrangea in a circle. Push or hammer them into the ground with a rubber mallet. Wrap burlap that is the same height as the plants around the stakes. Secure the burlap to the stakes with a staple gun. Fill the area inside the burlap with oak leaves if your winters are extremely cold for weeks at a time. Remove the burlap, stakes and oak leaves in mid-spring. Cover the plant with a bed sheet through the night if there is danger of frost. The 'limelight' hydrangea (Hydrangea paniculata) is a deciduous shrub that blooms from mid-July until September. The flower of the 'limelight' hydrangea is light-green when it first blossoms in July but slowly changes to a shade of deep-pink by September. Set the potted hydrangea in a sunny location in your home, where the hydrangea will receive indirect sunlight for most of the day. Potted hydrangea plants can be damaged by direct sunlight. Place the hydrangea container into a watering tray. Fill the tray with water and allow the plant to set for 30 to 45 minutes. The hydrangea plant will soak up the water, providing proper moisture content. Remove the plant from the watering tray as soon as the soil is moist (not soaked). Prolonged exposure to water increases the chance of fungal growth and disease. Mist the hydrangea blooms and foliage with a gentle misting bottle. The hydrangea will also take in water this way. Prune away any dead or dying foliage using sharp pruning shears. Make your cut where the dead or dying shoot joins the main shoot. 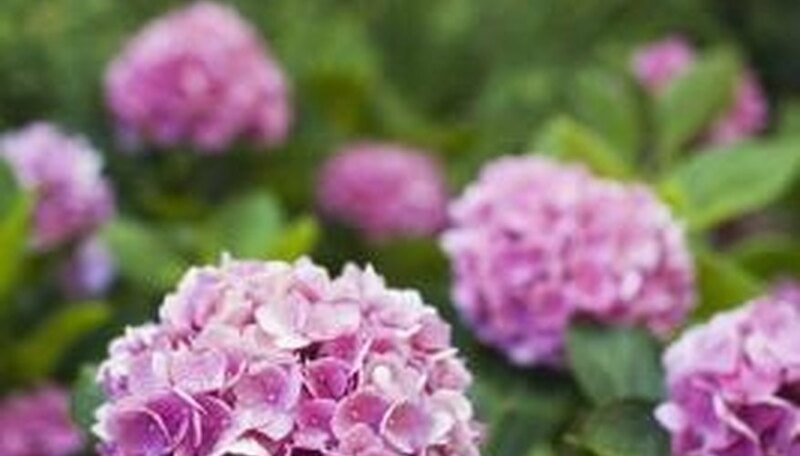 Fertilize the hydrangea once per month using a water-soluble fertilizer. Water your plant while still in its original pot. Let the water drain for 10 or 15 minutes. Fill the new pot with potting soil specifically made for acid-loving plants. The-Artistic-Garden.com says you can make your own potting soil by mixing two parts packaged potting soil, two parts coarse sand, two parts peat moss, one part leaf mold and 1/3 part well-composted manure. Pull gently on your hydrangea to loosen it from the original pot. Gently brush off excess dirt, tug lightly on any wrapped roots, and then place in the new pot. Backfill with potting soil, tamp down firmly and water. Water daily for the first week, and after that when the soil is just barely dry. Potted hydrangeas dry out very quickly and require large amounts of water. Fertilize every two weeks during the growing season with a liquid fertilizer for acid-loving plants or one that promotes blooming. If you want to keep the flowers' vibrant blue color, do not use fertilizer that contains phosphorous. Place your pot in bright, but not direct, sunlight. Make sure that your Glowing Embers hydrangea is planted in the proper location. It should get partial sun to shade and be planted in well-drained soil with an acidic pH. Water your hydrangea until the soil is saturated. In the spring keep the soil moist and then, in late summer to early fall, back off on the watering until the top 1 inch of the soil is dry. Fertilize the hydrangea in early spring with a 10-10-10 granular formula at the rate of 2 lbs. per 100 square feet. Check the hydrangea for common pests such as aphids, scales and spider mites. If you encounter an infestation, check with your county cooperative extension agent for the recommended insecticides for your area. One variety of hydrangea, Hydrangea seemanii, a climbing variety, is an evergreen. According to the United States National Arboretum, approximately 23 varieties of hydrangea exist, including the popular French and Hortensia varieties, which are not evergreen. Feed big-leaf varietals of hydrangea with an all-purpose formula lightly three times throughout the growing season in the early spring, early summer and early fall. Apply according to product label dosing directions being careful not to exceed 1 pound of fertilizer for every 100 square feet divided among the three feedings. Fertilize varietals of panicle and oakleaf hydrangea plants twice per growing season with a balanced formula with a half-pound per 100 square feet of soil in each fertilizing session. Make the first half-pound feeding in spring and the second in early summer. Feed smooth leaf hydrangea varietals once every year in the late winter with a balanced water soluble formula and apply in a dose commensurate with the label recommendations. Determine bloom color on your big-leaf hydrangea plant by choosing the fertilizer or amendment that cues blue or pink flowering. Use fertilizer low in phosphorus to grow blue flowers. 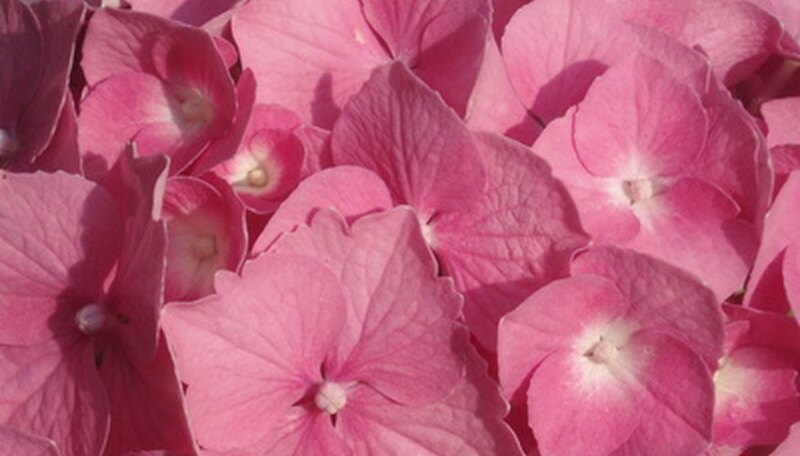 Use a balanced phosphorous formula to produce pink hydrangea blooms. Remove leaves that will be under the water when the flowers are placed in the vase. Fill a vase with room-temperature water. Boil 2 to 3 cups of additional water in a medium saucepan. Pour the boiling water into a tall container, and place the hydrangea's stems into it. Remove the hydrangeas after 30 seconds in the boiling water, and plunge the stems into the room-temperature water. Remove all leaves from the lower portion of each hydrangea flower. Leaves under the water rot and cause the flowers to wilt. Cut 1/2 inch from the bottom of the hydrangea stem while holding it under running water. Poke holes around the hydrangea stem, 1 inch from the bottom, with a small needle. This helps the stem absorb water. 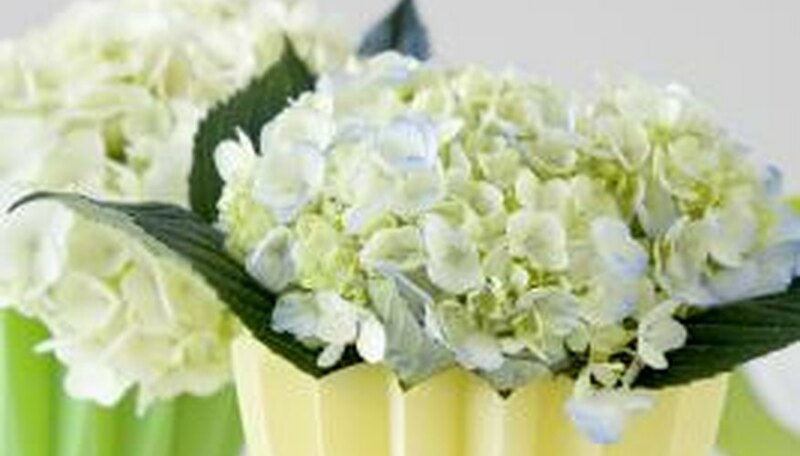 Add a packet of flower freshener, available at nurseries, to the water in the vase and place the hydrangea in the vase. Pull the flowers from the arrangement every three days. Cut another 1/2 inch off the bottom of the stems, under running water and at a 45-degree angle. Pour out the water in the vase, add fresh water and replace the flowers in the vase. Check for damaged or dead branches. Low lying branches may get trampled and bruised by critters. Older stems can die; these will have yellowed leaves and dull woody stems. Prepare a 1:10 solution of bleach:water in a small bucket. Dip your pruning shears in this solution, then clip off a dead or damaged branch at its intersection with the trunk. Dip your pruners in the solution again, then make the next cut. Remove all damaged and dead growth in this manner. Clean your pruners again and dry them with a towel before continuing. Cut off weak shoots that develop near the base of the plant, eliminating both old and new weak growth. Remove any stems that do not bear flowers. Head back the hydrangea to keep it smaller and more compact. Trim back all branches by several inches, keeping a uniform shape all around. Sprinkle the granular fertilizer around the base of the peegee hydrangea in late winter while the bush is still dormant. Consult package recommendations for the size of the shrub and apply the fertilizer to the top of the soil, covering the entire area between the outer drip line of the shrub to within approximately 4 inches of the center trunk. Use the hand rake to work the fertilizer into the soil completely. Water the shrub generously immediately after applying the fertilizer to help the fertilizer soak down to the roots of the shrub. Repeat steps 1 through 3 again when the shrub finishes flowering for the season. Choose a spot in your garden that will provide your plant with morning sun and afternoon shade. The oakleaf does not tolerate wet roots and is more prone to root rot than other hydrangea varieties. For best results, provide a light, loamy soil with good drainage. Water the oakleaf hydrangea often enough to keep the soil moist, but not soggy. Fertilize the oakleaf hydrangea two times during the summer up until August. Use an all-purpose 10-10-10 fertilizer. Always water prior to fertilizing. Prune your hydrangea in July by cutting off dead branches and flowers. Unlike other hydrangeas, the oakleaf will bloom on new growth. Hydrangeas are perennial shrubs that die back to the ground in the winter, but extremely cold weather may kill them. The climbing hydrangea and smooth hydrangea varieties are cold hardy to USDA zone 4. Bigleaf hydrangea is hardy to zone 6. Oakleaf hydrangea is hardy to zone 5. Panicle hydrangea is the hardiest, growing into zone 3. Selectively cut some of the old wood down to a height of 18 to 24 inches. This will provide a framework of support for the coming season's new growth. This should be done in late winter or early spring. Prune the remainder of the old wood down to ground level. Deposit the pruned plant material in your compost bin. Prune to remove old blossoms. Cut just below the flower-head. Deposit the spent blossoms in your compost bin. The best time to plant a hydrangea is in either late summer or early fall. If you need to move an established hydrangea, do it in the late fall or early winter when the bush has lost all of its leaves. Pluck off all the leaves on the cut hydrangea's stem. Leaves drain the stem and flower of moisture and energy and can decrease the life of the flower. Heat water to 100 to 110 degrees Fahrenheit--the optimal temperature for absorption by cut flowers, according to the University of Illinois--and completely immerse the hydrangea in the water. Let the flower soak for two hours. This rehydrates the entire flower, including the stems and petals, and perks up even wilted flowers, according to "Hydrangeas: A Gardener's Guide." Repeat this step whenever the flowers begin to wilt. Cut the bottom inch off of the hydrangea blossom's stem before inserting it back into a vase full of water. This helps increase the stem's water intake, keeping the blossoms looking fresh. Trim again every two days. Add cut flower food, available from most florists and some garden stores, to the water in the vase. 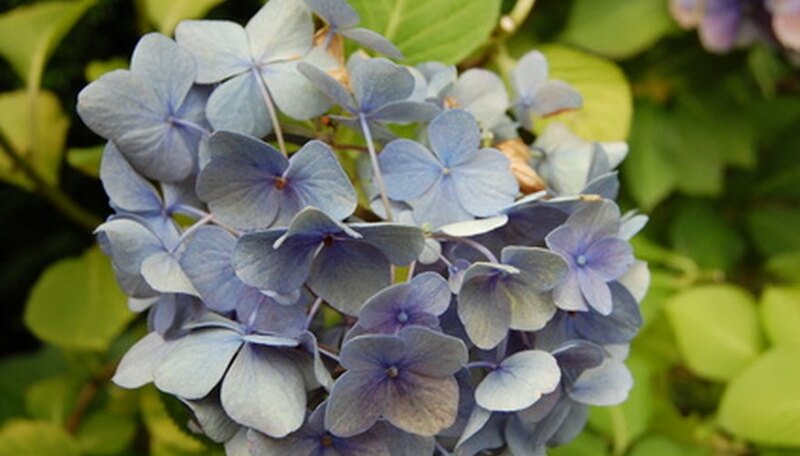 Such products contain vitamins and minerals that feed the hydrangea, helping to maintain color. Mist the hydrangea flower's petals throughout the day to help guard against wilt. Prune the hydrangea plant before it begins to bloom. Remove any brown, dried or dead foliage to make room for new growth. Take care when you prune so you do not to damage the hydrangea. Water the hydrangea plant often, depending on the frequency of rain in your area. If the winter was a dry winter, water the hydrangea heavily by soaking the soil around the plant thoroughly. Hydrangeas require large amounts water because of their large blooms and thick foliage. The soil around the hydrangea should always be moist to the touch. Add a water soluble fertilizer when you water. Fertilize the hydrangea once before it begins to bloom in the spring, and once per month following, until blooming has ceased for the winter. You can purchase a water soluble fertilizer at your local garden specialty store, or home improvement store. Apply mulch around the hydrangeas. The mulch should be approximately 3 to 4 inches deep. The mulch will aid in keeping weed growth down, and will retain moisture so the hydrangea plant will stay well hydrated in the upcoming summer. Deadhead the hydrangeas in the summer by removing only the withered flower heads. Use sharp hand clippers or garden scissors to cut the base of the stalk just under the flower head. Do this for the first few years until a wooded base develops. Do not cut off the last wave of flower heads in the fall; leave them to insulate the tender buds over the winter. After the first new growth appears in the late spring, prune the old growth to just above the new growth line. Only do this if you want to keep the plant from getting too large. Otherwise, the plant does better when it isn't pruned. Don't expect as many flowers during the years it's pruned. 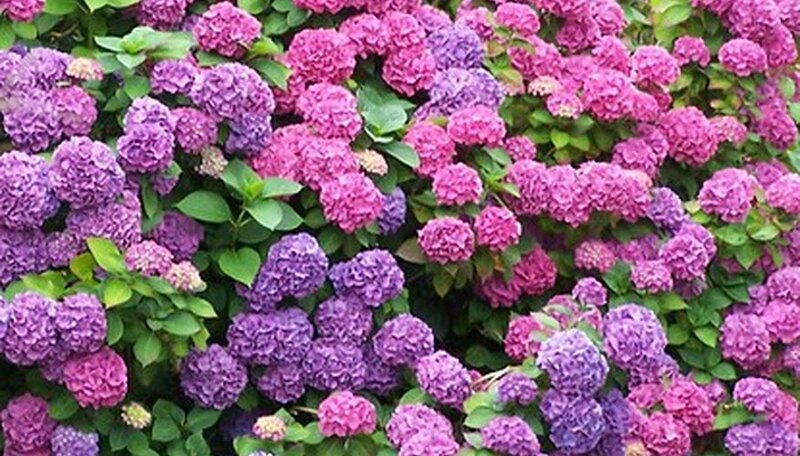 The color of a hydrangea will depend on the soil where it's grown. If your soil is acidic, the plant will produce blue flowers, while alkaline soil results in pink blooms. The presence of aluminum in the soil is what determines the coloration, according to the Clemson University Cooperative Extension. Plant your hydrangeas in a place that gets sun in the morning but shade in the afternoon. Planting in hot, dry locations will result in stunted growth and no flowers. Hydrangeas should be planted in well-drained, organic soil. Keep the soil around your hydrangea moist at all times, but do not over-water. Soggy or waterlogged soil can promote root rot or other diseases. Measure between 12 and 15 tbsp. of limestone for every 10 square feet of soil area. Sprinkle this amount of limestone carefully and evenly over the soil. Scratch the limestone into the soil lightly with the hand rake to incorporate it into the soil. Water the soil thoroughly so it can readily absorb the limestone. Repeat the limestone treatment two to three times each growing season to keep the pH level above 6.0. Fertilize the limestone by mixing liquid fertilizer with water according to package recommendations for the size of the hydrangea shrubs. Add the fertilizer to the soil around the hydrangeas, taking care not to splash it onto the plant's foliage to avoid burning the leaves and stems. Fertilize the hydrangeas in early spring and early or midsummer. Prune mopheads only when they overreach their space or become so old that they produce very few blooms. Deadheading old blooms and removing dead wood should be done annually, as part of spring cleanup, but pruning may be needed only every few years. Remember that mopheads produce flower buds on old wood, that is, previous years' growth. In temperate climates (essentially zones 3-6), buds are formed in August. Schedule pruning for June or early July, giving plants a chance to establish their size for the year but avoiding damage to summer blooms. Cut back plants to the desired size, trimming from the outside. If plants are severely overgrown, remove a third of the largest stems down to the ground, then trim the remaining stems. Removing stems will diminish blooms somewhat for the season but may be the only way to effect a substantial reduction in plant size. Prune nikko blue hydrangeas in early to mid-spring just as leaves begin to emerge to maintain health. Cut damaged or dead stems, another name for trunk and branches, back to the ground. Prune nikko blue hydrangeas as their flowers begin to fade (late summer) to establish shape. Nikko blue hydrangeas look best with a rounded or slightly triangular shape. Remove fading flower heads, making cuts above strong buds (where leaves and stems emerge). Cut stems back to the ground that are crossing or rubbing other stems. Hydrangeas will only bloom if there are buds from the growth the previous year. Blooming then will occur during the summer season. Wait until the flowers are partially dry on the plant before cutting them. The petals should feel slightly papery instead of soft and moist. In most areas, hydrangea flowers for drying are ready to cut in late summer or fall. Cut the flowers in the morning, while temperatures are still cool but after the dew has dried. Strip all the leaves from the stems. Arrange the flowers in a vase, but don’t add water. Use a flower frog in the bottom of the vase if needed to hold the stems in place. Keep the vase of hydrangeas out of direct sunlight as the flowers slowly finish drying. Hydrangeas are perennial shrubs that are hardy in zones 3 to 9. They can be grown in full sun but prefer shade at midday. There are a number of varieties, the most often grown being the gandiflora (also called smooth), oakleaf, peegee and French hydrangea. All are woody shrubs with large flower clusters. The grandiflora hydrangea has showy flowers that turn from green to white to pink throughout the summer. It grows from 3 to 5 feet tall. The French hydrangea (lace-cap being a sub-variety) can grow up to 8 feet tall and has blooms that grow so large they weigh down the branches. French hydrangeas change color depending on how acid the soil is--the more acid, the bluer the blooms; the more alkaline, the blooms become more pink. The peegee hydrangea ranks as a small tree that grows up to 25 feet tall. Oakleaf varieties grow as tall as 6 feet. Hydrangeas can be planted in any well-drained, fertile soil. Grandiflora may send out runners and can easily produce an entire group of new plants. Hydrangeas like light to full shade but will tolerate sun as long as they get afternoon shade. Container-grown plants can be planted in the spring or fall. French and grandiflora hydrangeas should be placed 3 feet apart, pegees at least 6 feet apart and oakleaf hydrangeas about 5 feet apart. Water generously after planting and in times of drought. Hydrangeas can be pruned in late winter or early spring. Grandifloras can be pruned to the ground. French varieties can be pruned of weak branches. Dead flowers can be cut to improve flowering. Oakleaf varieties don't usually need to be pruned unless there are damaged or weak branches. Cut hydrangeas in the morning before the flowers dry out. Have a bucket of fresh water available to place the flowers in immediately after cutting. Make a preservative by mixing 2 tbsp. of fresh lemon juice, 1 tbsp. of sugar and 1/2 tsp. of bleach in a quart of hot water. Use this water in the vase that will hold the arrangement. Cut the stems again before arranging the flowers. Use a small hammer to crush the ends of the stem and allow the plant to absorb water more easily. Remove leaves that will be below the water line in the vase and arrange the hydrangeas immediately in a vase filled with the hot preservative water. Change the water in the vase every two days with fresh preservative water. Re-cut and crush the stems and return the hydrangeas to the vase. A harsh winter or summer is the most common reason blooms fail to appear on a hydrangea. Most hydrangea plants generate buds the year before they bloom. Frost may kill most of the winter foliage and destroy the buds on the branches. If temperatures are too warm, the plant will not flower and the buds can fall off. Fresh growth comes in the spring and summer for the next years flowering season. Hydrangea plants need abundant amounts of water and nutrients to form buds that mature into flowers. Rich compost and mulch should be added to the plant base yearly to replenish nutrients in the soil. Hydrangeas require slightly acidic soil with ample drainage. The roots should be kept moist throughout the growing season to encourage lush flowers. Pruning in fall, winter, or spring can sever newly formed buds causing the plant not to bloom the following summer. Hydrangeas, such as the Smooth Hydrangea, flower from current years growth. Lack of pruning the Smooth Hydrangea can cause the plant to become very bushy with minimal colorful flowers. The plant should be pruned in fall immediately after the blooms have faded. Measure 1 tbsp. of hydrated lime and pour it into your bucket or watering can. Add 1 gallon of water over the hydrated lime and stir to dissolve the lime. Pour the hydrated lime over the soil around the hydrangeas, taking extreme care not to splash any liquid onto the plant foliage, because it will burn tender foliage. Pour the hydrated lime until you thoroughly saturate the soil. Repeat the hydrated lime application two more times during the growing season throughout the spring months. Apply the fertilizer to the soil during the spring and again in midsummer. Sprinkle ¼ cup of fertilizer around a small bush, 1 cup of fertilizer around a medium-size bush and 2 cups of fertilizer around a large bush. Scratch the fertilizer into the soil with the hand rake and water the soil generously. Start with an already pink hydrangea plant. Hydrangeas turn blue in response to aluminum in the soil. 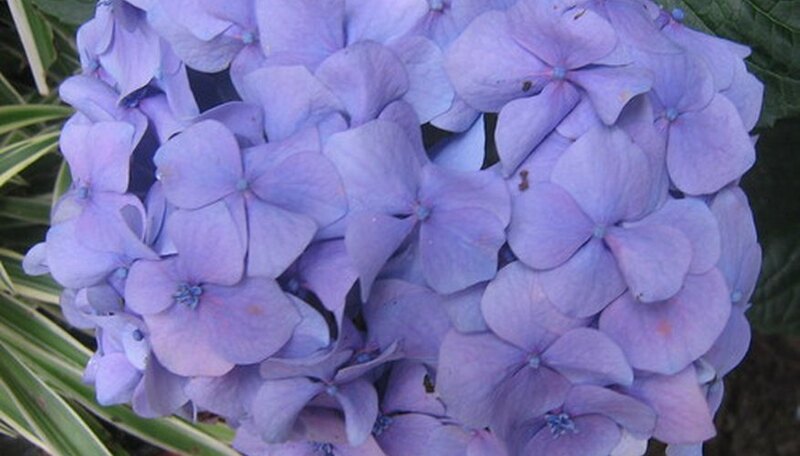 It is easier to make a hydrangea blue by adding aluminum to the soil than it is to turn it pink by shielding it from aluminum present in the soil. Add an aluminum-free granulated fertilizer with a high level of phosphorous such as a (25-10-10) fertilizer by scratching it into the soil with a cultivator around the dripline of the plant. Hydrangeas produce more vivid blossoms if they are healthier. Phosphorous will also naturally shield hydrangeas from aluminum. Add dolomitic lime to the soil by scratching into the soil with a cultivator around the dripline. Dolomitic lime will raise the pH of the soil by making it more alkaline. This will inhibit the plant’s ability to take up aluminum from the soil. Repeat this process up to four times yearly. Hydrangeas generally should not be cut back, except to remove dead stems—but if pruning is necessary, do so in June or July to prevent harm to next year's blooms.